Aintree International Equestrian Centre, 24-25th February. Hayley Reynolds and her four-year-old Dartmoor Coppinshill Commemoration (Roly) maintained their unbeaten record in some style when impressing judges Helen Horsfall (in-hand) and Aintree International Equestrian Centre manager Carly Sage (ridden) to take the supreme in-hand and ridden championships. Since buying him as a stallion last September, Hayley had already gained three in-hand wins and three championships from as many starts, and they added another tricolour here when heading a strong line-up from all sections. Roly, was bred by Bev Simcox at the Coppinshill Stud by Springwater Happy Day x Shilstone Rocks Another Beach. “We gelded him and had him backed over the winter and he was an absolute breeze to do, he’s loving the ridden work,” said Hayley, who bought Roly for her son Lewis to ride in lead-rein and first ridden classes. Eight-year-old Lewis and Roly are certainly maintaining winning form as they have now claimed two wins out of two starts, the pair winning the first class of the morning here and ended the pony sections by clinching the overall ridden title. “I just love him, he’s so easy to sit to and ride,” said Lewis. It proved a productive day for the Reynolds family, as they also took the reserve in-hand championship with the three-year-old Fell colt Drybarrows Advocate. Taking the reserve ridden pony supreme were the part-bred winners Rachel Birchall riding the Rhona Timson bred Brindlebrook First Lady (Paige). Paige has been a consistent winner for Rachel at local level, their highlights including the supreme accolade at the supreme showdown finals. “I bought Paige as a hobby and we enjoy schooling and hacking at home,” said Rachel. Standing first reserve was Waxwing Prince Hal (Thomas) who gave his rider, 10-year-old Lexie Hallwood a lovely ride to top the small M&M class. Lexie is just six months into her partnership with the Eyarth Beau Geste 14-year-old and this was their second show. “He is a cheeky pony, but he really looks after me,” said Lexie, who is a member of the East Cheshire Branch of the Pony Club. The new partnership of Harrison Fewings and Telynau Hot-Shot (Louie) gained a win on their seasonal debut, the pair heading section 2 of the junior ridden mountain & moorland (M&M) class. Harrison’s mum Lynsey (Cottrell) bought Louie last year to replace the now outgrown Section A Ffynnonbach Rosetta. Louie, a Welsh Section B six-year-old enjoys lots of hacking at home. “I’m a great believer in hacking for pony and rider to get to know each other,” said Lynsey. Harrison Taylor had a dream start to the season with the Skellorn Monarch five-year-old Skellorn Prairie Starlight (Star) who won the large M&M class. 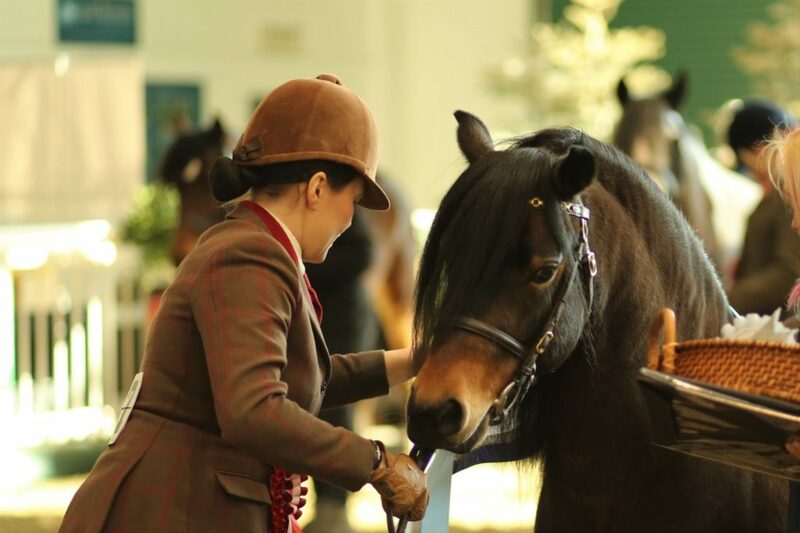 Harrison had only sat on Katy Seedhouse’s five-year-old Connemara seven days earlier and he had him at home just four days before the show. “We did a showing clinic last night and then came here,” said Harrison. Harrison’s mum Nicola has Star, who was bred by Kerry Wainwright on loan for two seasons. “He has a lovely temperament and great movement and presence,” said Nicola. After a few local outings last year, five-year-old Lylah O’Brien and Poppet Of Tourment really strutted their stuff to win the lead-rein class. The 11-year-old Dartmoor mare had been bought four years ago for Lylah to grow into and this was their second victory this year, following a win at Croft Top. Ellie Taylor and Buddhist Punk (Paddy) topped a strong coloured line-up. Ellie is entering her third season with the nine-year-old piebald traditional gelding who she bought unseen from Cornwall. “We saw him advertised and travelled to Bristol to meet a horse transporter. That was the first time we saw him in the flesh and it was love at first sight,” said Ellie, who is a nursing student at Edge Hill University and keeps Paddy match fit with some good spins along Crosby beach. Macey Crabtree and Mountpleasant Jack Flash opened their 2018 season with a win in the show hunter pony class. Jack, a seven-year-old chestnut gelding was bought unbroken and after being backed at home, Macey’s older sister Chloe introduced him to ridden classes two years ago prior to Macey takin over the reins last season. “He’s a clockwork pony who is very easy to ride in the ring and he loves fun rides at home,” said Macey. At the end of some well supported ridden horses and carrying the side-saddle for only the fourth time, winning cob Hawklands Argento Amore (Gento) gave a foot-perfect display to take the horse championship for Floriann Gilston. In their first season last year, Floriann and Gento were successful in the middleweight hunter division, the pair qualifying for the amateur middleweight championship at Hickstead. However, the decision was taken over the winter to hog the upstanding seven-year-old, who will now be campaigned as a maxi cob. Gento, a pure bred Irish Draught, bred by Stephen and Gail Payne is by the prolific sire Avanti Amorous Archie out of Hawklands Silver Wind. “This was a big ask today, but he has really taken to me riding sideways,” said Floriann. Anne Wilson’s Allied Answer displayed exemplary manners to win his large riding horse and ex-racehorse classes for Dannii Thexton, the pair going on to stand reserve champions. Cumbria rider Dannii has been riding the 10-year-old grey gelding for the past four seasons, the pair qualifying for the large riding horse final at HOYS last October. Allied Answer combined flat and hurdle racing when in training. He ran 13 times in all finishing first past the post three times. “In the ring he has manners to burn and always seems to give the judges a good ride,” said Dannii. Freya Metters enjoyed a winning double with Raine Harthern’s Wenckstern five-year-old Littletree Whirlwind (Wilbur) who topped the hunter and sport horse classes. Wilbur was placed in the sport horse classes at the National Hunter championships last summer and he has spent the winter hacking and doing local clinics. “He’s still a bit green, but we are all very excited about him,” said Freya. Best hack was Sarah Livesey’s Manduro seven-year-old Oscuro (Oscar), who raced four times. The pair combine racehorse and hack classes and they qualified for the RoR final at Hickstead for the past two years ago. Sarah hopes to book her return ticket to Hickstead and is also aiming for Equifest. Becky Edge is enjoying competing her winning small riding horse Solitair’s Jack Of Diamonds as he is proving equally at home in showing, jumping and dressage arenas. “We won our one and only dressage competition and he loves to jump,” said Becky, who intends to try SEIB Search for a star qualifiers. Emma Waters’ “overgrown pet” The Panda II stood top of a strong traditional gypsy cob class for Emma’s daughter Elle Waters-Jones. Bought unbroken three years ago, Panda has progressed well through the novice grades since Elle backed him. The seven-year-old blue and white stallion won his novice final at the 2016 CHAPS championships and he qualified for the BSPA finals at Hickstead last July. “He has such a lovely way of going and for a stallion, he has a fabulous temperament,” said Elle. Day two proved equally as busy for Team Aintree as fences were laid for the working hunters. It proved a busy day for Katherine Bowling-Hartenfield who decided to give her Highland ponies Ruby Rose Of Strathmore (Ruby) and Cree Marvin a spin over fences. After winning her unplaited pre-novice and novice classes, the Lochlands Royal Flute seven-year-old Ruby took the pony championship. Katherine bought Ruby from her Scottish breeder Charlie McQuattie as a weanling and has enjoyed many successes on the flat. Highlights include taking the supreme title at the Highland breed and she finished third at HOYS last year and qualified for Olympia. “I thought a change of scenery would do her good, so we tried some workers and she loves it. This is our fourth win out of four starts,” said Katherine, who also employed the same tactics with Cree Marvin who topped the plaited pre- novice and novice classes. “I didn’t think it would do him any harm, so as not to compete against Ruby, I bobbed some plaits in Marvin,” concluded Katherine. After riding Millfield Cassidy (Fuzz) for just a few weeks for owner Stephanie Holker who is on maternity leave, Jo Ainsworth took the horse championship after producing a super round to win the open section. Fuzz, a nine-year-old by Cassius V contested the HOYS working hunter qualifiers last year and combines show jumping classes. As Jo lives close to Stephanie, she travels once a week to give the impressive grey a school stallion a school. “We had a brief show jumping outing a week ago and this is our first workers. He’s easy to ride, as he knows exactly what he’s doing and he’s good at his job,” said Jo. Michael can be quite lazy, but he loves to jump and he is very focused in the ring.